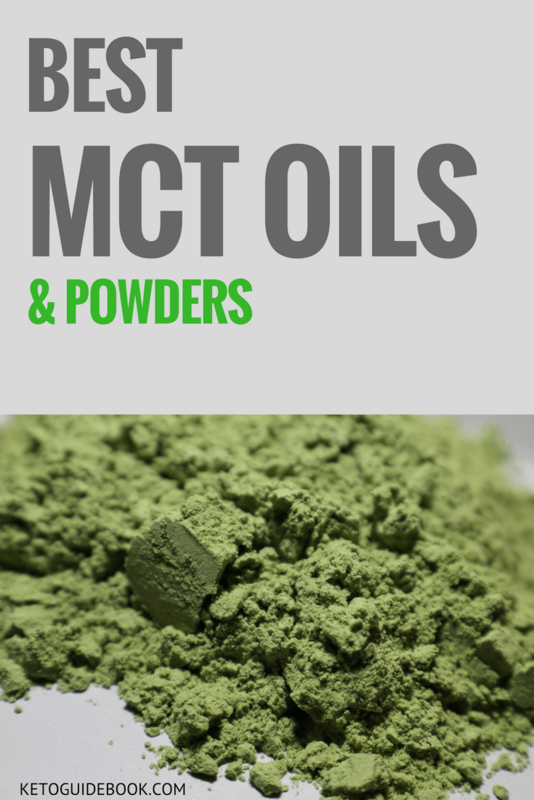 Those into keto know about the buzz concerning MCT oil and powder supplements. The question is which supplement provides the best results? MCT (Medium-chain triglycerides) based products offer long-lasting energy in a form that is easy to digest. Energy supplements like these are necessary on an excellent ketosis diet. Below are seven of the products receiving high reviews from scientists and consumers. What makes the range of Onnit MCT oils very popular, is the added flavoring to an utterly flavorless product. People enjoy mixing them with other foods. In reality, there is no need to add flavoring. It blends well without flavor. The product hides behind existing flavors when added to food. There is an original version available without any added flavoring. Many people claim it helps in cognitive function improvement while adding a ketogenic diet. The nearly 100 percent of MCT oil comes from coconuts. Coconut oil is an excellent source of Lauric Acid. Studies show it to be an excellent slow-burning body fuel. A ketogenic diet low in carbs needs slow-burning fuels for energy throughout the day. A constant slow-burning source helps the brain maintain concentration and focus. Listening better and more precise thinking are signs the mind is absorbing information. When situations call for decisiveness, the user is better equipped to deal with it. The most outstanding quality of Onnit MCT is the ability to suppress appetite causing the ketosis process to take hold effectively. The result is substantial and sustainable weight loss. People add it to coffee in the morning and find their food intake decreases while simultaneously feeling energetic and alert. This product is a chart topper. It rapidly absorbs and metabolizes to boost fat burning capacity, ketones levels, and energy levels. The powdered form is easy to digest. It is convenient to add to your favorite beverages or shakes. C8 (Caprylic Acid) improves GI tolerability. It has a hydrocarbon chain shorter than Lauric or Capric Acid. Therefore, it passes quickly to the liver where the enzyme metabolism takes place. C8 has strong antifungal, antiviral, and antibacterial properties. It improves blood lipid profiles. Whether or not you are in ketosis, C8 MCT Oil Powder boosts blood levels to improve energy and mental acuity. This product contains 95 percent pure C8 MCT. A clean fuel source ensures maximum results. It is not the cause of gastrointestinal upset. C8 MCT is safer to take in more copious amounts because of its lack of potentially harmful substances. The clean fuel makes ketone conversion faster and more straightforward. It boosts ketone production that is a proven method for brain power improvement. A study conducted on both obese and lean men showed a definitive metabolic change for both groups. The study monitored heat released by the body when metabolizing food. Both groups experienced fast metabolic rates after consuming C8 MCT. The results were similar in other clinical trials. The findings prove this is a quality product. Some people report side effects such as a stomach ache when taking an oil form of MCT. Perfect Keto MCT Powder is easier on the digestive system. The powder mixes well and gives your drink an excellent creaminess. You add healthy fats and delicious taste to smoothies and coffee. It contains no sugar. Powdered MCT is convenient. You carry it when traveling. There are no artificial ingredients in this product. Acacia fiber makes the powder form. Acacia fiber is a gut-friendly probiotic. It is among the best fiber supplements for those on a keto diet. There are no disgusting ingredients or fillers such as soluble corn fiber of maltodextrin. A one scoop serving has 7g of fat and 70 calories. It is ideal for mixing with keto pre-workout drinks. There are three flavor choices. A functional medicine clinician developed and recommended Perfect Keto MCT Powder for low GI distress. Its pure form easily absorbs MCT fat acids used by the muscles, brain, and other tissues for energy. MCTs are ketone precursors. MCT Oil Powder primes the body to adjust from burning carbs to burning fat. It assists in physique sculpting and weight loss. It is an ideal product for people wanting the benefits of oil without the mess. Brain octane oil is available naturally in coconut oil. This product provides a concentrated form of the energy. It enhances cognitive performance and supplies energy to physical and mental health briskly. By making Bulletproof Briance Octane a component of your routine, you experience a downfall of food cravings while obtaining satisfaction. Your level of performance upgrades. There are no chemicals or harsh solvents in the product. A unique triple distillation method removes them with pressure, heat, and water. It is an extremely pure and clean product. Brain octane absorbs instantly and converts to ketone bodies. They furnish the brain with energy. The product prevents the breakdown of carbohydrates into glucose. You experience effects of quality fuel. The best parts of coconuts make brain octane. The octane yield in Bulletproof Briance Octane is four times greater than ordinary coconut oil. It promotes improved immunity and healthy digestion. The best features include that it is tasteless and odorless. It is easy to acclimate. The product gives focus and energy and moisturizes the skin. Skin complexion improves and provides a glow. Bulletproof Briance Octane helps retain memory. It also contains C8 that offers octane oil that provides mental and physical energy while maintaining a balance of candida in your digestive system and helps burn fat. This medium-chain triglyceride product contains 7.5g of MCT oil in each serving. The product offers a steady stream of energy all day long and boosts weight loss. MCT Oil Powder helps raise ketone serum levels. It is ideal for the ketogenic lifestyle. Medium-chain fats digest easily and travel directly to the liver. A thermogenic effect causes a conversion to ketones. Unlike other energy sources, it is not necessary for MCTs to absorb, store or use energy. They are nearly the perfect natural energy source. This product is gentle to the stomach. Endless possibilities of how to use it include adding it to baked goods, shakes, coffee, and other beverages. An enjoyable creamy treat boosts energy, cognition, and weight loss. MCTs are a form of saturated fatty acid that has health benefits that range from providing energy throughout the day and boosting metabolism. MCTs processed in the liver absorb quickly and provide fast, sustained energy. You conquer the day and control appetite simultaneously. You enjoy the feeling derived from burning fat. It tastes good enough to put in everything. MCT Oil Powder is an excellent addition to a recipe. There is no oil slick left behind after mixing. Travelers say it passes security and takes up very little room. 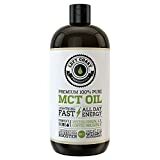 Another pure MCT oil supplement option is Left Coast MCT Oil. This high-quality product derived from coconuts contains Caprylic and Capric fatty acid. For the budget conscious, Left Coast MCT Oil is among the best in price. This is another MCT product that is triple filtered making it the highest quality possible. The manufacturer uses a low-heat, time-consuming process. The company tests each batch for impurities and heavy metals. The product provides lightning fast energy. It absorbs quickly, metabolizes, and converts to ketones. Those who have absorption or digestive issues find Left Coast MCT Oil easy on the stomach. Add it as a creamer to coffee, or in other beverages or smoothies. It is an excellent addition to salads. The manufacturer recommends starting slowly with a 1/2 teaspoon and working toward a full serving to avoid GI distress. This MCT product helps maintain healthy cholesterol levels. It ignites the body’s metabolism. Left Coast MCT Oil is ideal for building weight management and athletic goals. This MCT oil is perfect for suppressing cravings and improving mental clarity. 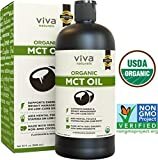 This pure coconut MCT oil is gluten-free and approved for vegan and paleo diets. It is free of flavors, additives, and fillers. The all natural product is an extract from only hand-picked, fresh, sustainably harvested coconuts. Viva Naturals Non-GMO supports weight management. It behaves differently than other products. Rather than enzymes breaking down in the pancreas, the supplement produces ketones offering an alternative fuel source for increased fat burning potential. It is perfect for paleo and low-carb diets. It also supports energy and mental focus. Ketones offer carbs and energy to the brain. As the primary source of energy, it helps improve stamina and is perfect for athletic performance. It is tasteless and odorless. The sensitive palate appreciates that there is no odor or taste. It is ideal for making homemade salad dressing. It is a traditional oil substitute. Put it in your morning coffee, in sauces, and in smoothies. Healthy fat sources provide many significant benefits. They help gain ketosis and process fats burned for energy. Viva Naturals contains the entire MCT spectrum including Lauric acid that works to remove bacteria from your body. It antimicrobial and antiviral properties work well on gut health. There is a reduction in harmful bacteria, but good bacteria remains. Quality matters. You want a product that is additive and filler free. Coconut oil and not palm oil is the main ingredient. These long-term use products are perfect for a high-quality source of fats and fibers. Consumers appreciate the benefits and improved energy associated with a healthier immune system and better cognitive performance.